DIE Veneris, 31 die Octobris. Dr. Holdsworth's Petition, to be bailed. E. of Not's Pet. for his Pension from the Customs. Ordinance for an Addition to the Vicarage of Kirtling. Ordinance concerning the Dutchy of Lancaster Seal. Message to the H C with it; and with the following Particulars. Col. Fielder discharged from being Governor of Farnham; and desired by the Surrey Gentlemen to command their Forces against Donnington. Parishioners of St. Dunstan's in the East, to shew Cause for not admitting Mr. Wilkinson to be their Minister. and with a Committees Name for Advance of Money. 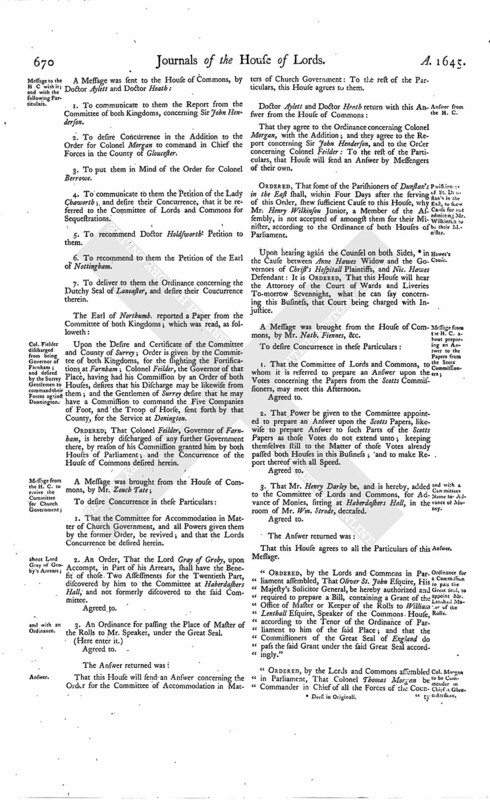 Ordinance for a Commission to pass the Great Seal, to appoint Mr. Lenthall Master of the Rolls. Col. Morgan to be Commander in Chief in Gloucestershire. and to command the Surrey Forces against Donnington. Ds. Grey de Warke, Speaker. Upon reading the Petition of Doctor Holdsworth, desiring he may be bailed: It is Ordered, To be recommended to the House of Commons, in regard of his great Indisposition of his Health. That they will send an Answer to the Particulars, by Messengers of their own. Upon reading the Petition of the Earl of Nottingham, concerning his Pension out of the Customs: It is Ordered, To be recommended (fn. 1) to the House of Commons. An Ordinance was presented to the House, for adding Fifteen Pounds Rent to the Vicarage of Kirtling, in the County of Cambridg; and it was read, and Agreed to, and Ordered to be recommended to the House of Commons, for their Concurrence. An Ordinance concerning the Dutchy of Lancaster, was brought in, read, and approved of; and Ordered to be sent to the House of Commons, for their Concurrence. 1. To communicate to them the Report from the Committee of both Kingdoms, concerning Sir John Henderson. 2. To desire Concurrence in the Addition to the Order for Colonel Morgan to command in Chief the Forces in the County of Gloucester. 3. To put them in Mind of the Order for Colonel Berrowe. 4. To communicate to them the Petition of the Lady Chaworth; and desire their Concurrence, that it be referred to the Committee of Lords and Commons for Sequestrations. 5. To recommend Doctor Holdsworth' Petition to them. 6. To recommend to them the Petition of the Earl of Nottingham. 7. To deliver to them the Ordinance concerning the Dutchy Seal of Lancaster, and desire their Concurrence therein. Upon the Desire and Certificate of the Committee and County of Surrey; Order is given by the Committee of both Kingdoms, for the slighting the Fortifications at Farnham; Colonel Feilder, the Governor of that Place, having had his Commission by an Order of both Houses, desires that his Discharge may be likewise from them; and the Gentlemen of Surrey desire that he may have a Commission to command the Five Companies of Foot, and the Troop of Horse, sent forth by that County, for the Service at Donington. Ordered, That Colonel Feilder, Governor of Farnham, is hereby discharged of any further Government there, by reason of his Commission granted him by both Houses of Parliament; and the Concurrence of the House of Commons desired herein. 1. That the Committee for Accommodation in Matter of Church Government, and all Powers given them by the former Order, be revived; and that the Lords Concurrence be desired herein. 2. An Order, That the Lord Gray of Groby, upon Accompt, in Part of his Arrears, shall have the Benefit of those Two Assessments for the Twentieth Part, discovered by him to the Committee at Haberdashers Hall, and not formerly discovered to the said Committee. 3. An Ordinance for passing the Place of Master of the Rolls to Mr. Speaker, under the Great Seal. That this House will send an Answer concerning the Order for the Committee of Accommodation in Matters of Church Government: To the rest of the Particulars, this House agrees to them. That they agree to the Ordinance concerning Colonel Morgan, with the Addition; and they agree to the Report concerning Sir John Henderson, and to the Order concerning Colonel Feilder: To the rest of the Particulars, that House will send an Answer by Messengers of their own. 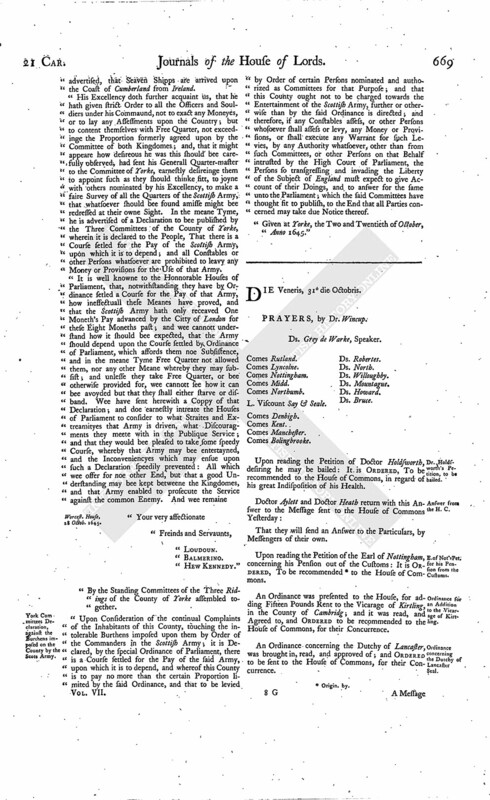 Ordered, That some of the Parishioners of Dunstan's in the East shall, within Four Days after the serving of this Order, shew sufficient Cause to this House, why Mr. Henry Wilkinson Junior, a Member of the Assembly, is not accepted of amongst them for their Minister, according to the Ordinance of both Houses of Parliament. Upon hearing again the Counsel on both Sides, (fn. 2) in the Cause between Anne Hawes Widow and the Governors of Christ's Hospitall Plaintiffs, and Nic. Hawes Defendant: It is Ordered, That this House will hear the Attorney of the Court of Wards and Liveries To-morrow Sevennight, what he can say concerning this Business, that Court being charged with Injustice. A Message was brought from the House of Commons, by Mr. Nath. Fiennes, &c.
1. That the Committee of Lords and Commons, to whom it is referred to prepare an Answer upon the Votes concerning the Papers from the Scotts Commissioners, may meet this Afternoon. 2. That Power be given to the Committee appointed to prepare an Answer upon the Scotts Papers, likewise to prepare Answer to such Parts of the Scotts Papers as those Votes do not extend unto; keeping themselves still to the Matter of those Votes already passed both Houses in this Business; and to make Report thereof with all Speed. 3. That Mr. Henry Darley be, and is hereby, added to the Committee of Lords and Commons, for Advance of Monies, sitting at Haberdashers Hall, in the room of Mr. Wm. Strode, deceased. 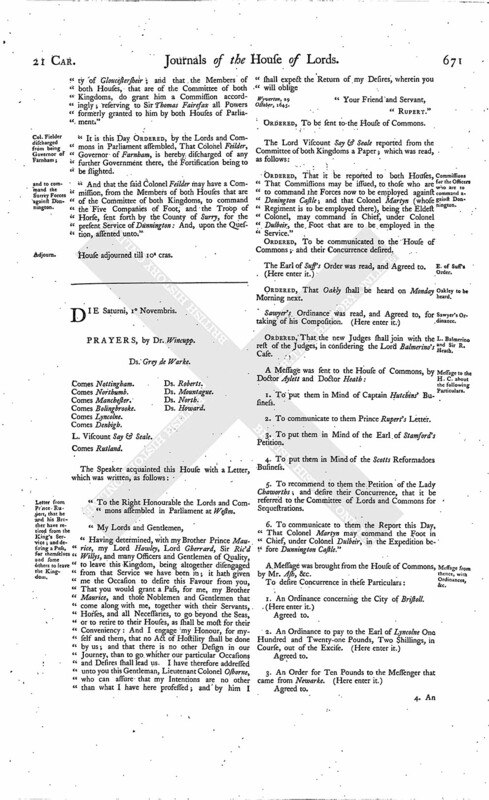 "Ordered, by the Lords and Commons in Parliament assembled, That Oliver St. John Esquire, His Majesty's Solicitor General, be hereby authorized and required to prepare a Bill, containing a Grant of the Office of Master or Keeper of the Rolls to William Lenthall Esquire, Speaker of the Commons House, according to the Tenor of the Ordinance of Parliament to him of the said Place; and that the Commissioners of the Great Seal of England do pass the said Grant under the said Great Seal accordingly." "Ordered, by the Lords and Commons assembled in Parliament, That Colonel Thomas Morgan be Commander in Chief of all the Forces of the Coun ty of Gloucester sheir; and that the Members of both Houses, that are of the Committee of both Kingdoms, do grant him a Commission accordingly; reserving to Sir Thomas Fairefax all Powers formerly granted to him by both Houses of Parliament." It is this Day Ordered, by the Lords and Commons in Parliament assembled, That Colonel Feilder, Governor of Farnham, is hereby discharged of any further Government there, the Fortification being to be slighted. "And that the said Colonel Feilder may have a Commission, from the Members of both Houses that are of the Committee of both Kingdoms, to command the Five Companies of Foot, and the Troop of Horse, sent forth by the County of Surry, for the present Service of Dunnington: And, upon the Question, assented unto."